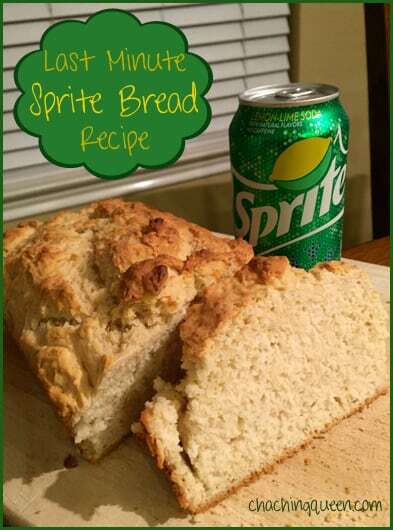 I call this a Last Minute Sprite Bread Recipe, because it truly was made last minute. Late in the afternoon, I was trying to decide what to make for dinner to go along with our leftover corn beef. I looked up some recipes for bread. 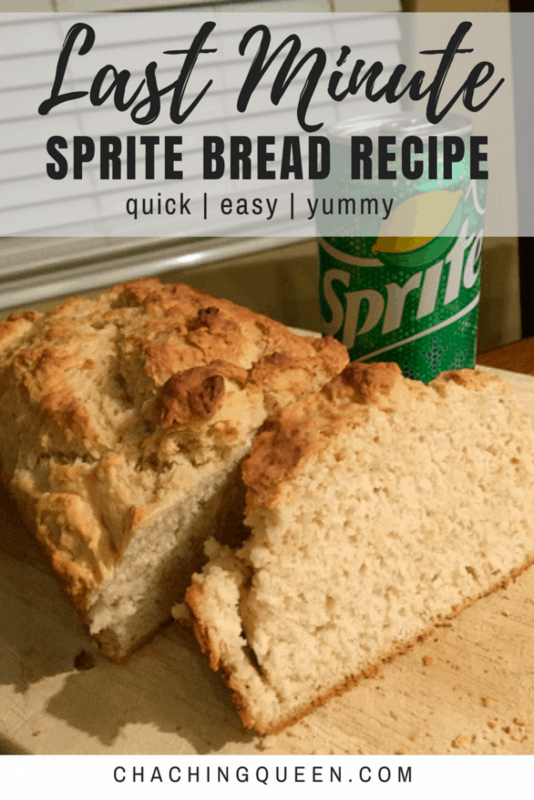 I came up with this easy Sprite bread recipe by combining a few different beer bread recipes and doing some improvising. Important note: When making bread it is important to sift the flour. This helps the bread come out light and bread-like. If you do not sift, your bread can come out hard and brick-like. 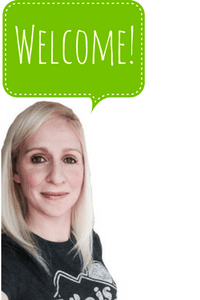 This bread recipe is so easy and is made from ingredients you most likely already have at home. 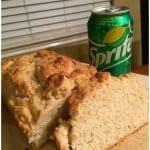 To get started with this easy, Sprite bread recipe, get your self-rising flour , butter, yeast, and Sprite together. Then follow the directions below to make a last minute bread that only takes about 55 minutes total to make and bake. Mix all of the ingredients (reserving a few teaspoons of butter) either in the greased loaf pan or a separate bowl. Do not over mix. The dough should not have any dry ingredients visible. If you mixed your ingredients in the bowl, transfer to the dough to the loaf pan. Pour the remaining butter on top of the dough. Bake for around 45 minutes or until fully baked inside. Use the toothpick test. If an inserted toothpick comes out dry, the bread should be done. Remove the bread from the loaf pan. Let sit for at least 15 minutes before slicing. It’s that easy! The bread came out super moist with a nice hearty crust on the outside. I’m snacking on the fresh, warm bread as I write this.